Providing you the best range of shangar patiala suit, readymade patiala suit, designer rang house cotton salwar suit, kalamkari cotton satin salwar suits, victoria salwar kameez and abhushan vol-2 designer salwar suit with effective & timely delivery. 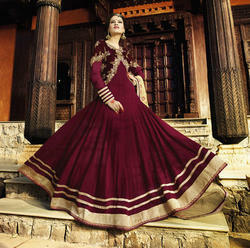 Our organization is bringing forth a beautiful collection of Exclusive Designer Suits. This suit is purposely designed for women for various events such as weddings, birthday parties, and dance parties. Vibrant and visually appealing, Beauty will get you noticed for all the right reasons. This is quite comfortable to wear and easy to care for.This Product reach to you as a Indian Wedding wear Unstitched Chudidar fashionable style dress material with Fabric of (Top: Pure Cotton Weaving Butty,Bottom: Pure Cotton,Duptta: Chiffon with heavy work, Inner:NA),Color of (Top: Green, Bottom:Black, Dupatta:Black ) with measurement of (Top:2.5 Meter, Bottom: 2.5 Meter,Dupatta:2.25 Meter, Inner:NA).100% Genuine Manufacturer Product from Patiala House. Our organization has gained recognition in offering a wide assortment of Exclusive Salwar Kameez that is highly demanding in the market for its premium quality and cost effectiveness. The offered salwar kameez is demanded all over the nation for its variety of colours, designs and other such specifications. Further, our offered salwar kameez is tested on well defined parameters in order to meet the specific requirements of our clients. Moreover, clients can avail this salwar kameez from us at rock bottom prices. Look elegant and charming just like Karishma Kapoor in this attractive casual wear cotton dress material.This Peach color churidar salwar suit dress material is an ideal outfit for all casual and social events. The suit comes along with cotton bottom and chiffon dupatta. Look as beautiful as Karisma Kapoor by cladding into this Purple color dress material adorned with fancy embroidery work. This party wear dress material will give a comfy and voguish look to the wearer when paired along with fashionable accessories.The suit comes along with cotton bottom and chiffon dupatta. Description: This Fashionable Straight Suit in Maroon ColorTop , Beige Bottom And Dupatta with Heavy Pattern Embroidery Work On It.It Contain with Georgette Top , Shantoon Bottom,And Chiffon Dupatta.This Classic Indian Style Anarkali Suit Gives Gorgeous Look For Party,Wedding . The offer qualitative product is strictly tested by our quality experts on various parameters in order to ensure that we provide high grade products to our clients. We feel immensely glade to offer an exclusive spectrum of Latest Designer Suits that are an envy of every fashion loving woman. Our offered suits are designed using high grade fabric that is procured from some trustworthy vendors of the market. This Fashionable Salwar Suit in Color Red Top , Bottom Red And Red Dupatta with Heavy Pattern Embroidery Work On It.It Contain with Pure Cotton Cambric Top , Pure Cotton Bottom ,And Nazmin Dupatta. 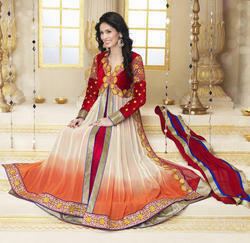 This Classic Indian Style Salwar Suit Gives Gorgeous Look For Party,Wedding . The offer qualitative product is strictly tested by our quality experts on various parameters in order to ensure that we provide high grade products to our clients. Slight Color variation May be Possible due to photography lighting,your monitor resolution or picture tube variances. As a reputed organization, we bring a comprehensive collection very fashionable Pakistani Embroidery Suits that are in-line with the prevailing fashion trends. Our offered suits designed using quality tested fabric and latest technology in sync with the set industry norms. Our offered suits are highly comfortable and enhanced beauty of the wearer. Our offered suits are well known for their elegant designs and beautiful colors among our clients. These suits are available in various patterns and sizes that suit the exact demand of the client. Grab all the limelight on any occasion that you attend with this fascinating long length designer dress material just like Karishma Kapoor. This Black color un-stitched suit is made from cotton fabric and beautifully decorated with fancy heavy zari, resham embroidery work that gives a tempting look to the outfit. This designer suit is a perfect attire to wear on special occasions. The suit comes along with cotton bottom and chiffon dupatta. We are involved in offering a commendable array of Straight Cut Suits. Our offered suits are infusing energy in your persona by draping and known for their alluring designs and eye catching colors. The suits offered by us are designed using best quality fabric and contemporary technology. Furthermore, prestigious clients can avail these suits from us at the most competitive price. Leave an impact on everyone around like to bollywood diva Karishma Kapoor in this exemplary cotton designer dress material. This gorgeous sky blue color un-stitched salwar suit is attractively decorated with archetypal resham,lace work. Complete your wardrobe by adding this enigmatic outfit to your designer collection. This charismatic outfit is accompanied with cotton bottom and chiffon dupatta.